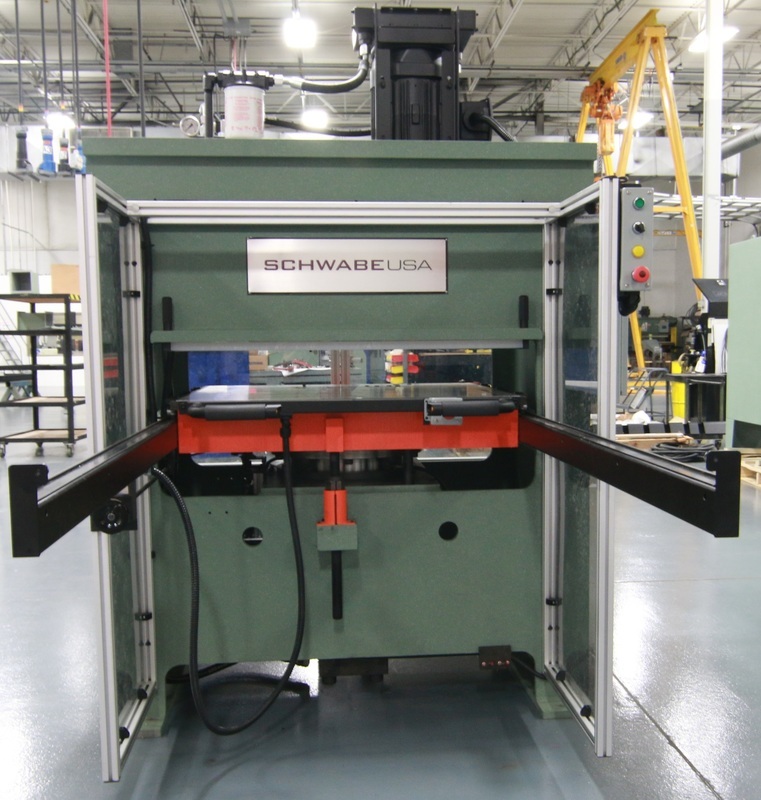 Model DG is designed to cut vacuum formed plastics, blister/skin packaging, rubber and other sheeted products. These Presses also die cut sheet goods and can be adapted with various feed systems to handle roll good materials and are engineered to operate economically, with a minimum of maintenance. Built in Cincinnati, Ohio, U.S.A. Ideal mechanical press in manufacture of auto interior parts and medical clean-room applications and other types of molding applications in which programmable tonnage, pressure and speed are required. Flexibility of Custom Design / Applications Molding PressSchwabe straight ram (SR) provides full tonnage over the entire stroke of the platen and quality 3D molding. Hydraulic cylinders are removable from the open structure of the top piece not hidden in a table bed structure. Rod seals can be changed without removing the cylinders in most designs. Die loading from any of the four sides of the platen or bed is possible; again, promoting flexibility and customization. Die sets used for molding applications that completely separate can readily be used with optional extra long guide engagement. This design is ideal for self-contained die sets application as well. Platen lock-up pins are standard to provide safety during die maintenance when platen is in full up position. Optional rod locks for full stroke safety can be provided. Touch Screen Panel View which can be mounted electric box, pedestal, or strong arm mounted. Platen, Lock-up pins, and Hydraulic cylinder rods. Maintenance of the press itself is limited to lubrication. Wear items are few consisting of split guide bushings, lock-up pin bushings, and positive stop screws and nuts.